The Jan Andolan Party Central Youth wing today pasted poster in Kalimpong town different Places. 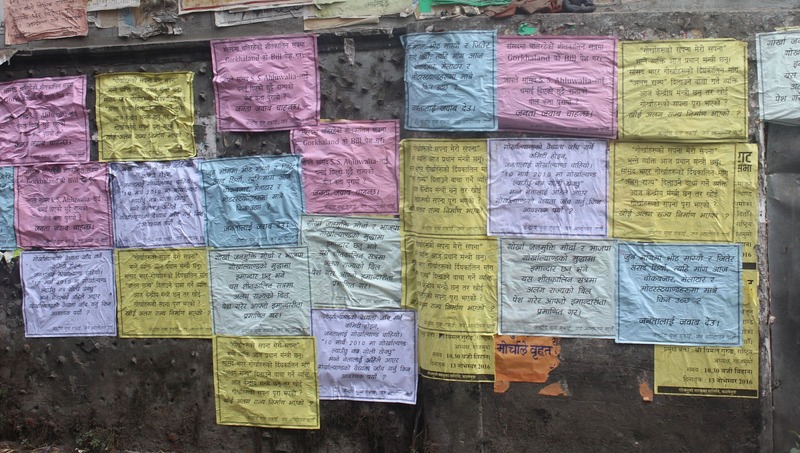 The poster demanding the MP S S Ahluwaliya to place the Bill of Separate state of Gorkhaland in the ongoing winter session. The JAP party have asked where has the Separate State bill reached which JAP has given to MP before the State legislature elections? JAP youth committee secretary Amir Basnet talking to media persons after the postering program said “ Our MP won the elections on one point agenda of Separate state of Gorkhaland. “ We have already submitted the Bill for separate state now it high time to place the same in the ongoing winter session” he added. He said one who said “Gorkhas Dream is my Dream” is now PM, one who promised separate state are minister in central government but neither the dreams have fulfill nor any separate state have been carve out. JAP said if BJP and GJMM is honest towards the demand of Gorkhaland then let them prove their honesty by placing the bill in the ongoing winter session of Parliament .JAP youth wing have given a one week ultimatum to MP failing which it will declare future program which will not be regional but national program added Basnet. 0 Respones to "JAP poster campaign against Darjeeling MP SS Ahluwaliya"